In 2004, Wolverine Gaskets was ready to evolve its image as a materials supplier to the automotive industry and step confidently into the 21st Century as a technology leader. The materials technology and technical expertise needed to complete the transformationwere already in place, all they needed was a brand which reflected their new confidence and ambition. With the help of PUSH 22, Wolverine has embarked on a comprehensive rebranding effort that began with extensive research and continues today as the company brings its innovative solutions to new industries and emerging markets around the world. The first major step was to rename the company Wolverine Advanced Materials to focus on its core strength – materials. We then created a new logo and identity standards which are used to guide marketing efforts across a broad range of traditional and nontraditional brand activation points – advertising, product-specific websites, sell sheets, literature, trade booths, customer toolkits and voice-of-the-customer surveys – targeted at both OEMs and the company’s aftermarket partners. We also provide translation and localization of key marketing assets for use in the European and Asian markets. 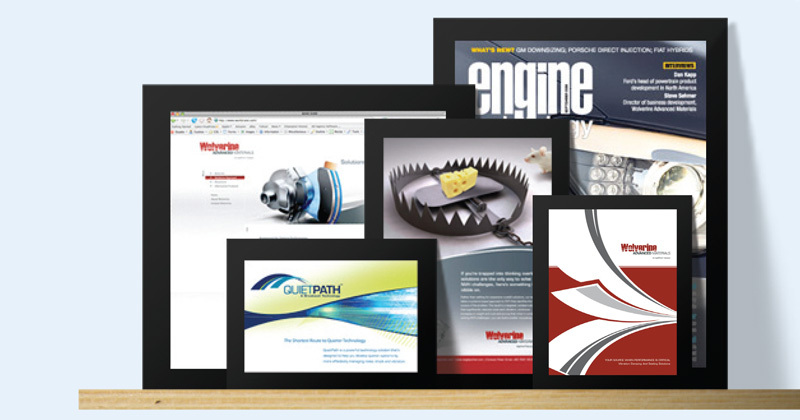 Rethinking its business was a bold step but with a redefined and unified brand strategy now in place, Wolverine Advanced Materials has the resilient brand it needs to unify its expanded marketing efforts and build its global customer base.